There is no shortage of Indian fashion designers around the world but for Bangladesh and Bengali women especially, a fashion designer career is new. On the story, Suswana Chowdhury, reports on one Bengali-American woman who is trying to uplift the Bengali culture and heritage through her fashion label. Mehjabeen Hassan, 24 years old, sits on her bed surrounded by yards of raw silk fabric in gold, blue, red, and white. Her room in Jamaica, Queens doubles as her design studio for her South Asian fashion label meant to represent the modern Indian-American woman. Born and raised in Bangladesh before emigrating to the U.S., Mehjabeen wants her clothes to reflect her dual identity both in style and creation. Mehjabeen associates the lack of acceptance for fashion as a career in Bangladesh and thus a lack of options for why most people purchase clothes from India. For many Bengali women, being a fashion designer is not considered to be a viable option. 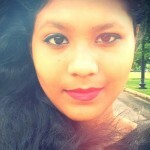 Bangladesh does have a relatively conservative culture that also permeates into the homes of Bengali-American children in the U.S. Mehjabeen herself has faced a lot of prejudice and resistance from family and others in the community. To try and renew the Bengali heritage in her fashion label, Mehjabeen creates designs with the natural fabrics found in the country as opposed to using synthetic materials. To many people outside of the culture, there might not be an obvious difference between Indian and Bengali fashion. But there is a distinction. However, Mehjabeen commented, in the age of globalization a lot of people in the community are mixing up the two cultures making it seem as if everything is borrowed from India. 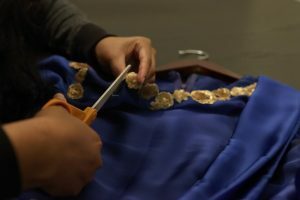 At the end of the day, Mehjabeen hesitates to call herself a fashion designer but hopes to one day expand the label into a recognized brand with a larger influence. “I feel like when people say ‘oh you’re a fashion designer,’ I still feel really, for lack of a better phrase, I still feel really awkward that I haven’t reached at that level where I feel like a fashion designer needs to be in order to be called a fashion designer,” she said. Mehjabeen is planning a trip to Bangladesh in 2018 to start building a factory that will pay women fair wages and start to close the skills gap between men and women in the country. Reporting for Baruch College, I’m Suswana Chowdhury. Special Thanks to Tina Burner, Miss Sherry Vine, and Industry Bar! Amelia Diaz arrived in the United States from the Dominican Republic 40 years ago. While working in a factory sewing clothes, it was her dream to become a hair stylist. She decided to attend beauty school, eventually earning her cosmetology license. Not only does she have many of the customers she’s had since the doors of her beauty salon swung open 25 years ago, her customer roster continues to grow. Anyone entering the energetic environment at the salon is greeted with echoes of chatter and laughter from clients of different ethnicities, blow driers and water running in the wash basins. Those are a few of the sounds bouncing off the salon’s lemony and tangerine colored walls, covered with posters of the latest hair styles, mirrors and outreach information meant to be of help to those in need. The salon is opened six days a week, with one day set aside for a special group of customers. A client’s true hair color may be the only thing that’s a well-kept secret at New Color Beauty Salon located in the El Barrio Section of East Harlem. What is no longer a secret to many, is owner, Amelia Diaz’s, generosity. Looking good is not the only thing that matters to Amelia. Doing something good to help others is much more important. Shortly after opening the salon, Amelia started a clothes drive because she wanted to send clothes to men, women and children in the Dominican Republic. In light of the recent storms that have ravaged the country, Amelia prefers to send the clothes and cash donations to a charitable organization such as the Red Cross. In recent years, she found that some of her customers and people in the community needed help as well. In this episode I interview several bouncers in New York City, getting the behind the scenes of how bouncers think while managing the front door of New York’s nightlife. In this Episode, I invited two of my friends to help me to analyze my dreams. We used Edgar Cayce’s dream dictionary and some personal experiences. Frank Ntilikina is the New York Knicks rookie from France and his nickname in the NBA is the French Prince. Every time he scores, Madison Square Garden plays the “Fresh Prince of Belair” theme song which gave me the idea to do a skit mixing his NBA rookie season storyline and the famous tv show together. The link below is the final version of episode 1. Arielle Rodríguez tells us her transition story and the many complications she went through. From bullying in school to self-medicating, Arielle is now fully transitioned and happy after many years of battling against society and her own demons.